Or maybe i didnt wind it enough?. (see photos for item specifics and details). Friedrich Mauthe Schwenningen . Antique Wall Clock Vienna Regulator 19th century. The wind up of the clock lasts about a week, key included! because if you do not have a minimum of knowledge or experience on antique or old clocks. MAUTHE Marble /onyx?Novelty Desk Clock - Germany. R u n n i n g m a u t h e w h i t e m a r b l e d e s k c l o c k. B a s e 6 1 / 4 ”, 1 7 / 8 ” d e e p, 3 5 / 8 ” t a l l. 2 ” d i a l. L o o k s l i k e g l a s s w a s replaced w i t h p l a s t i c.
F. Mauthe Clock Movement Germany. In working order. 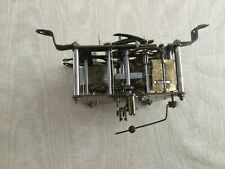 F. Mauthe Clock Movement Germany. In working order.. Condition is Used. Shipped with UPS 3 Day Select. Condition is Used. Bought at estate sale. SOLD AS IS. WE DO OUR BEST TO INFORM YOU OF THESE. GERMANY; ORIGINAL WESTMINSTER. ART DECO STREAMLINE Design. art déco ------------------------------------------------------------- art nouveau. THE DESIGN OF THE FABULOUS PIECE IS TYPICAL. THE ITEM IS OLDER THAN 75 YEARS. 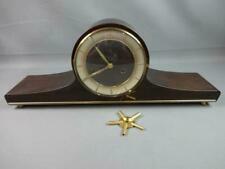 This is an original in the box Mauthe Electric battery clock. The second hand has the "sweep" or hover effect like the electric clocks. They have never been used. I have had them on a shelf since the late 60's but never used them. 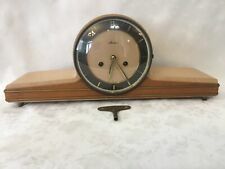 Vintage MAUTHE GERMANY 8 Day Travel Alarm Clock works not over wound. Condition is Used. Pin missing 7 jewel Shipped with USPS Package. Being sold as is, for parts or repair. 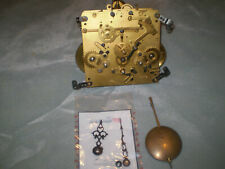 Includes hands, and correct, very nice pendulum. In collectors condition, everything is original and in excellent condition, dial, case, finish, carved trim, pendulum, key, and stained leaded glass door. This is a rare clock in pristine condition and would be a proud addition to any clock collection. NOTE: The clock is not tested. The winding key is missing. The item needs a thorough cleaning. Weight: 5.6 lbs. GERMANY; ORIGINAL MAUTHE. ART DECO STREAMLINE Design. art déco ------------------------------------------------------------- art nouveau. FOR ART DÉCO FASHION. THE DESIGN OF THE FABULOUS PIECE IS TYPICAL. It's in working condition. This is an antique clock showing wear. Signed/Marked: - Mauthe. The case is black. Condition: -Not working; wear from age. Wind up Key included. Made in West Germany (1950s). MADE OF ONYX AND IS HEAVY AND BEAUTIFUL, SEE PIC'S. This beautiful clock is approx. The clock is not working. It most likely just needs cleaning. Sold as-is for parts or repair. Mid Century Modern, made in Germany. To you Mauthe collectors it would be a wonderful addition to your clock collection! The face is marked "Mauthe" and "Made in Germany". The alarm does work. As you can see this clock has a wood and gold colored case accented with gold colored bolts on either side of the case. This clock is in very good working condition and includes the key. It was bought in the mid 60's. It is 23" overall top of the chain to the bottom. It's in great working order and in cosmetically excellent condition. Has beautiful 3 bar chimes and two keys for winding. Has a high gloss wood finish. The back has a few scratches where it attached to the wall, see photo. Made in the 1950's in Germany. Very rare, a collector's item! This is a beautiful ceramic clock. This is a very pretty clock. The edges look cork like on the ceramic with subtle scrolls within the ceramics. The clock works look sprung so it doesn't work. I have no key for the clock but did try winding it with one I had her and obviously it didn't work. In nice physical condition, as tested. Includes pendulum but no key. FRIEDRICH MAUTHE SCHWENNINGEN . The wind up of the clock lass about a week, key included ! because if you do not have a minimum of knowledge or experience on antique or old clocks. and if you need help with how to operate a watch we will be happy to help you. Back marks are 7R 19740.F. Mauthe Germany. Beautiful intricate brass cut zodiac sign face.With Moon shaped hour hand. Condition. Gently used. Is in Great working order. Missing screw knob that makes it able to change the hands of the clock( Iam sure to a clock collector this would be an easy find). Antique FMS Friedrich Mauthe Schwenningen Clock Vienna Regulator Unique Large Bell Strike. Would make a great gift or keep for yourself! with Horse Finial & Topper. The wood case has a lot of its' original elegance, appears to be made of mahogany. Not working, for parts or repair. Sold as is. Has been in storage for decades. Here is a recent estate find. 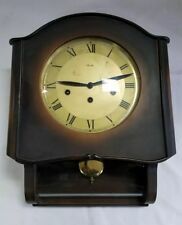 This is a Rare Antique Working 'Turn Of The Century' Mauthe German Victorian Carriage Clock Swiss Musical Alarm Clock, Made by Friedrich Mauthe Co. Schwenningen Germany. The Mauthe clocks had a long history in Germany. In 1876 the sons Christian (1845 - 1909) and Jacob (1847 - 1915) too over. In 1904 the 3rd generation took over with Eugene Schreiber (1877 - 1939) (the son of Christian Mauthe) and Dr Fritz Mauthe (1875 - 1951) (son of Jacob) and Alfred (1879 - 1911) (son of Jacob). Antique Grandfather Clock crafted in Germany approximately 1925. Recently serviced. Works and chimes in excellent condition. Minor facial blur. Authentic Mauthe alarm clock ivory color. Works well. GERMANY; ORIGINAL MAUTHE. ART DECO STREAMLINE Design. art déco ------------------------------------------------------------- art nouveau. FOR ART DÉCO FASHION. LÄNGE / LENGTH 57 cm / 22,4 ". HÖHE / Height 19 cm / 7,5 ". Antique German Mauthe German Holland Delft Blue Mantel Clock. VERY nice. GREAT condition. One chip on the top at the back. It works AOK. 10" h. 9" w. 3" d. YOU WILL LOVE IT! Glass face cover with two glass windows. Numbers are black. Musical components working and plays beautiful. Base of the clock is worn and needs cleaning. Lovely printed front plate around glass.